Hardware acceleration using FPGAs has shown orders of magnitude reduction in runtime of computationally-intensive applications in comparison to traditional stand-alone computers . This is possible because on an FPGA many computations can be performed at the same time in a truly-parallel fashion. However, parallel computation at a hardware level requires a great deal of expertise, which limits the adoption of FPGA-based acceleration platforms. A recent interest to enable software programmers to use GPUs for general-purpose computing has spawned an interest in developing languages for this purpose. 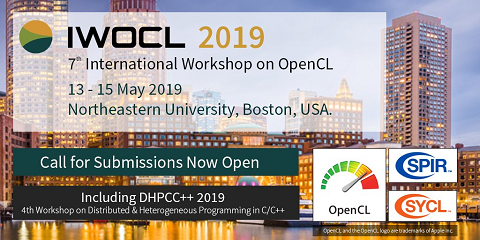 OpenCL is one such language that enables a programmer to specify parallelism at a high level and put together an application that can take advantage of low-level hardware acceleration. In this paper, we present a framework to support OpenCL compilation to FPGAs. We begin with two case studies that show how an OpenCL compilation could be done by hand to motivate our work. We discuss how these case studies influenced the inception of an OpenCL compiler for FPGAs. We then present the compilation flow and the results on a set of benchmarks that show the effectiveness of our automated compiler. We compare our work to prior art and show that using OpenCL as a system design language enables large scale design of high-performance computing applications.